Comes with a code to activate the game on Steam. Also sold together with Rise of the Owlverlord. 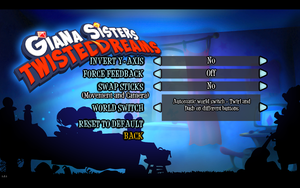 Apply the Giana Sisters: Twisted Dreams intro skip. 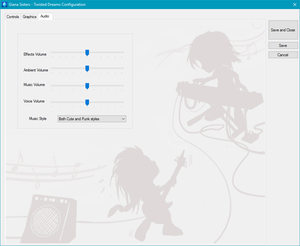 Use Widescreen Fixer with this plugin. See Run the game at screen refresh rate. Frame rate is capped at 124 FPS. 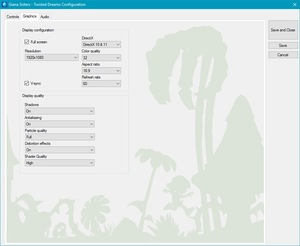 Some gameplay elements are bugged at frame rates above 60 FPS. 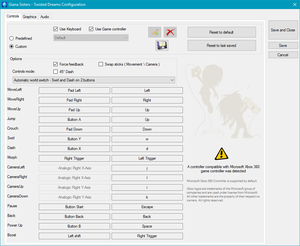 Settings in launcher requires, game can be launched with controller. 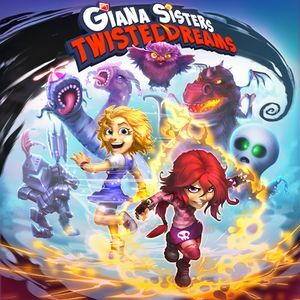 See Helix Mod: Giana Sisters: Twisted Dreams and Rise of the Owlverlord (DX9). Open <path-to-game>\dxgi.ini or %USERPROFILE%\Documents\My Mods\SpecialK\Profiles\GSGameExe.exe\SpecialK.ini depending on the installation method you used. DirectX 9 version uses <path-to-game>\d3d9.ini or \GSGameExe_DX9.exe\SpecialK.ini. ↑ 1.0 1.1 File/folder structure within this directory reflects the path(s) listed for Windows and/or Steam game data (use Wine regedit to access Windows registry paths). Games with Steam Cloud support may store data in ~/.steam/steam/userdata/<user-id>/223220/ in addition to or instead of this directory. The app ID (223220) may differ in some cases. Treat backslashes as forward slashes. See the glossary page for details. This page was last edited on 16 April 2019, at 03:34.